In recent years American foreign policy has taken a unilateralist turn. Confident of America’s economic supremacy and cultural magnetism, the Bush administration has embarked on an ambitious mission to further American interests and reshape global order. In this compelling and insightful book, Christian Reus-Smit offers a sustained critique of the Bush Doctrine and its impact on the United States and the world community. Far from being a realistic response to the challenges of the post-September 11 global order, Reus-Smit contends that the current neo-conservative approach to foreign policy is deeply idealist and naïve. He argues that the quest to re-establish US hegemony in the contemporary world is based on a flawed understanding of the nature of power and the complexities of the global system. This has led Washington to pursue policies ill-suited to addressing current sources of global disorder, such as intra-state conflict and transnational violence, inequality, alienation and environmental degradation. If this trend continues, Reus-Smit warns that it will have serious implications for global order and justice in the 21st Century. Christian Reus-Smit is Professor and Head of the Department of International Relations in the Research School of Pacific and Asian Studies at the Australian National University. He is author of The Moral Purpose of the State (Princeton, 1999), editor of The Politics of International Law (Cambridge, 2004), co-author of Theories of International Relations (Palgrave Macmillan, 2001), and co-editor of Between Sovereignty and Global Governance (Macmillan, 1998). 1. The Idealism of Preponderance. 2. The Alchemy of Power. 4. The Ethics of Moralists. Presents a detailed exposition of the theory of power underlying the neo-conservative foreign policy of the Bush Administration. 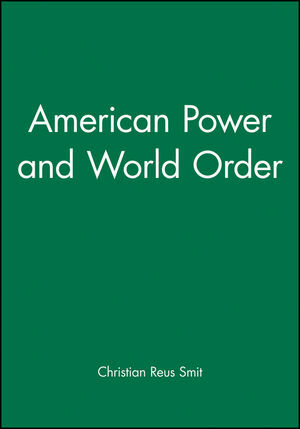 Argues that the US approach to power is fundamentally idealist and logically flawed. Explores the ethics of the Bush Doctrine and contends that the current US administration is pursuing a foreign policy strategy which could ultimately destabilise the world.